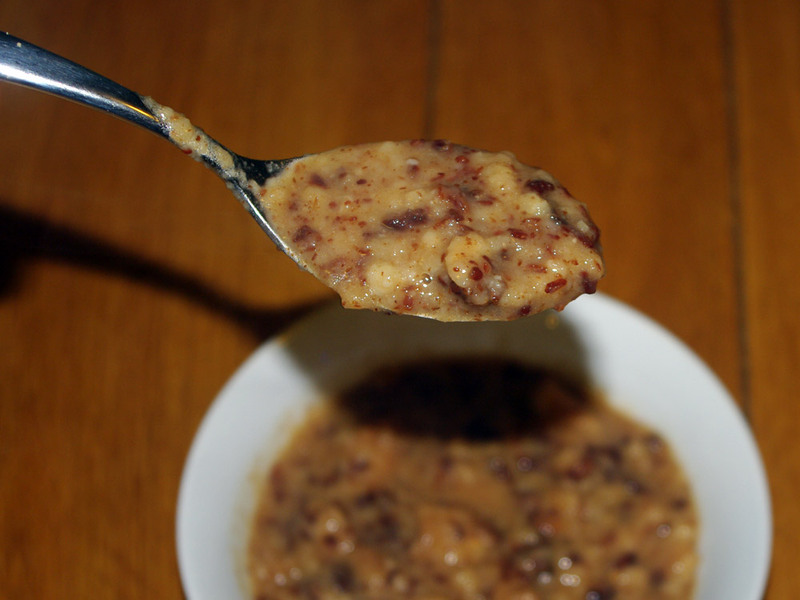 Preparation of hoosh, easy (assuming you already have pemmican). Hoosh has a good claim on being the most traditional recipe from Antarctica. It is one of the simplest of foods made from 3 ingredients, one of which you didn't even have to carry with you - snow or ice. In the Heroic Age of Antarctic Exploration, the explorers were powered along on a daily basis by hoosh. Rather than being an actual recipe as such, hoosh is really just a word for a stew made from the limited ingredients you have at the time, in the early days of Antarctic exploration there weren't many varied ingredients and so everyone's hoosh tended to end up pretty much the same. Shackleton, Scott, Amundsen, Mawson and any other explorer you might have heard of from that time ate mainly hoosh when out travelling whether manhauling or by dogsled. I spent time in Antarctica and on some occasions travelled away from base camping, at no point did I ever eat hoosh, by that time freeze dried meat had taken over from what we knew of as "meat bar" or pemmican. Rice, pasta or dehydrated potato had replaced the staple carbohydrate of sledging biscuits in cooked food. I was familiar with pemmican and sledging biscuits and had eaten them in "the field", particularly sledging biscuits, but not made into hoosh. Hoosh is something that people just don't eat much any more, even in Antarctica. The finished product, it tastes better than it looks - honest! You probably won't need to do this. I used crushed ice from the freezer for a degree of authenticity. The key when using snow for water is not to fill a pan with snow and put it on the heat, this will work, but takes ages. 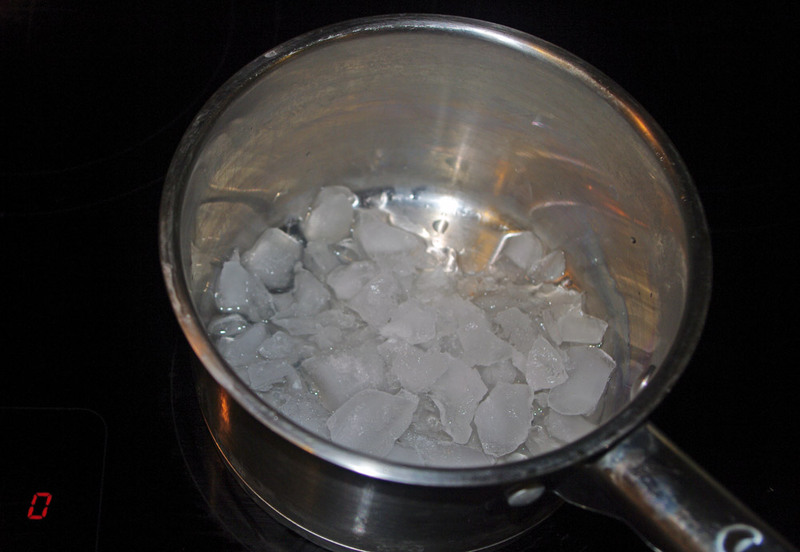 A more efficient way is to melt a little snow/ice at the bottom of the pan so you have a layer of water and then add more ice so it melts a little at a time in the water. 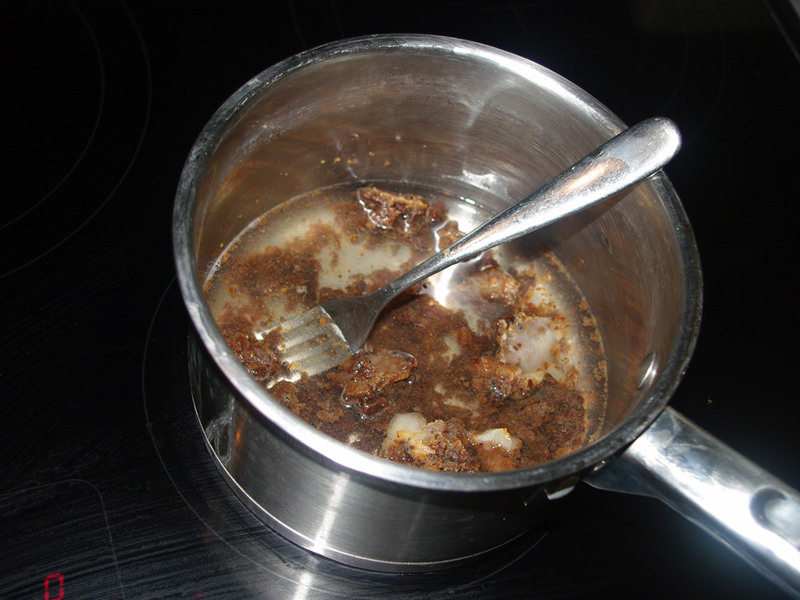 Break the pemmican up by hand or cut into pieces, add it to the water and mix. This is now already hoosh, a sort of bouillon (broth) made with pemmican as the mother of all stock cubes. 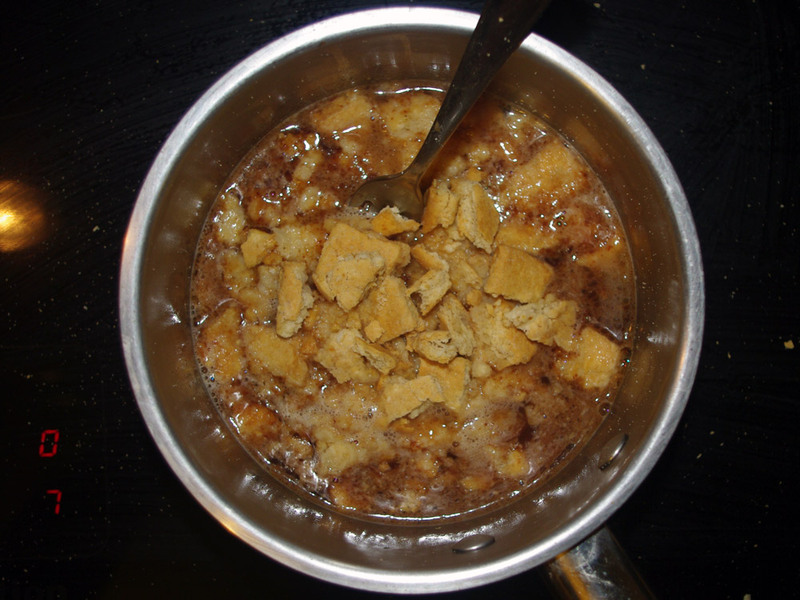 Break up the sledging biscuits and crumble into the pan, mix and heat through. The biscuit makes it very thick so you may want to add more water at this point to get the constituency you like. I thinned it down to a thick soup / runny porridge texture which I preferred. There's no real cooking needed as the ingredients are cooked already, it's just a question of making sure the ingredients are fully broken up, get the right thickness and make sure it's heated through. I wasn't anticipating anything particularly impressive from this. 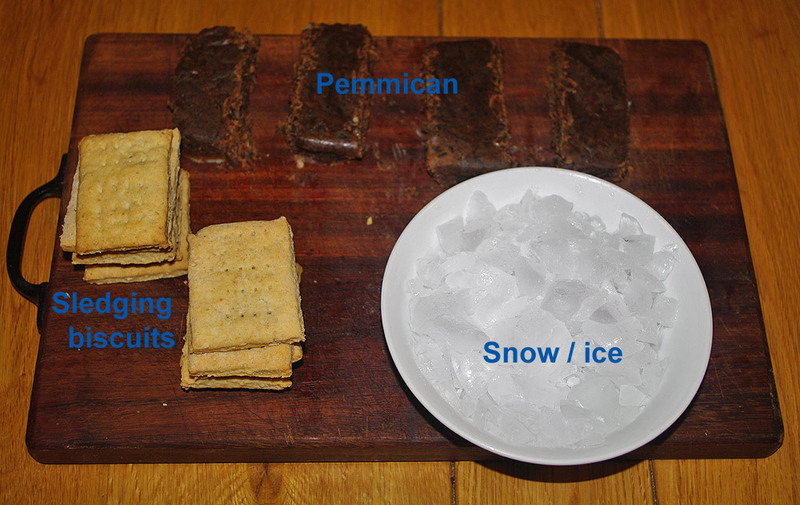 In the field in Antarctica, rather than eating hoosh made from pemmican we ate freeze dried meat used in a similar way to the pemmican accompanied by rice, pasta or dehydrated potato and that wasn't great so I assumed that hoosh with pemmican would be worse. I know it doesn't look it on the spoon in that last picture, but it was actually pretty good. I thought there might be a bit of a fat-slick from the pemmican but it wasn't to be seen at all, presumably dispersing itself through the hoosh. I couldn't get all of the meat in my pemmican down to a fine powder and so it had tiny pieces of jerky throughout (in a crunchy v smooth peanut butter sort of way) which I really liked, it gave me something to chew on and added texture. It felt very substantial, this is not a light meal! Though I was eating it in my warm kitchen wearing a t-shirt, I could imagine it being just the stuff to warm and fuel you up in freezing conditions at the end of a hard and cold day or during a lunchtime break. Should you try to make this? Absolutely! It was far better than I thought it would be and while the words "shall we have hoosh for dinner tonight" are never going to be heard in my house any time soon, it's a fascinating thing to try if you have any interest in Antarctica and its history. You'll have to make your own sledging biscuits which are really easy, I've never seen anything much like them for sale anywhere. For this recipe I used 120g of white flour + 30g of oats which improved the texture and flavour and was akin to Roald Amundsen's recipe for these biscuits. You will probably also have to make the pemmican yourself, be aware that it is quite time consuming and a fair amount of effort - it struck me as similar to if I'd decided to make my own bread at home starting with a small sack of wheat. There is stuff labeled as pemmican available to purchase though much of it is not as it should be, some of it is called "pemmican jerky" i.e. it is jerky, and some of it has no meat at all, neither should be called pemmican. If you try to buy some to make hoosh make sure you check exactly what you're getting, if you're unsure, it should be about half meat and half fat, if it's not, it's probably jerky or some made-up stuff. You could start with jerky and grind it up if you don't want to spend the time drying the meat. The recipe here is close to that eaten by explorers of the Heroic Age, These days, dried vegetables such as onions or peas would be added and dried herbs and/or sauces would be available to add extra flavour. There still aren't any fresh vegetables used in the field while travelling, they take too much space and weight and use too much fuel in the cooking while filling the tent with water vapour that could drip down or freeze on the canvas and make life uncomfortable. The quick cooking time of hoosh makes it ideal in this regard. When I made the pemmican I dried out a garlic clove and a piece of a habanero which I ground up and added to half of it, as a chili lover I thought that part was really good, the chili and garlic flavour had permeated throughout, probably also thanks to the fat and made it particularly tasty. Most non-Antarctic recipes for pemmican contain dried fruit such as berries, you could try this but it won't be very authentic for Antarctica.